 Ceviche Acapulqueno, from the Pacific Coast of Mexico (photo courtesy KatanaeStudio.com. 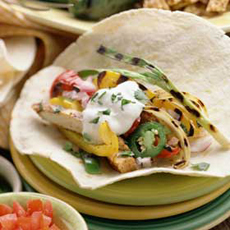 Tex-Mex foods like fajitas are not authentic Mexican (photo courtesy Wild Oats), but Tex-Mex cuisine that originated in Texas. 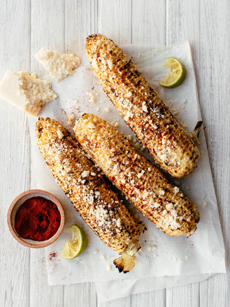 Elote, a Mexican street food, is grilled corn with grated cheese and other toppings. Here’s the recipe (photo courtesy Good Eggs). Chef Johnny Gnall’s mother is from Mexico, so he grew up eating the real deal: authentic Mexican cuisine. So today’s tip is: Cook something authentic for Cinco de Mayo. It’s easy to default to Tex-Mex favorites: most “Mexican” food North of the Rio Grande is Tex-Mex, a cuisine developed by Mexicans who moved to Texas (Tejanos). For example, beef, cheese-stuffed burritos and wheat [white] flour are not common in Mexico. You won’t find chili con carne there; or chimichangas, for that matter. Queso dips and fajitas were born in the U.S.A. Nachos were invented in 1943 on the Mexican side of the border, as a spur-of-the-moment solution to feed a group of Army wives from Texas who stopped at a restaurant when the kitchen was closed. Anything with beef, black beans, Cheddar or other yellow cheese, cumin, wheat flour, black beans, and canned tomatoes are Tex-Mex, a term that first appeared in print in the 1940s. Tex-Mex was developed by Tejano restaurateurs using local ingredients to appeal to gringos (there’s plenty of beef in Texas). The fusion cuisine began to expand nationwide when food writers “discovered” it in the 1970s. While cooking Mexican cuisine is often a multi-step process, there are some simple yet authentic dishes you can make. Also note: There is no single “Mexican cuisine.” As it is everywhere, different regions of any country have different specialties, based on local ingredients. Ceviche can be found throughout Mexico (and the rest of Central and South America). Its origins lie along the country’s coastlines, where fresh fish was a staple. Recipes vary according to the local catch. This recipe is a popular Pacific Coast ceviche. 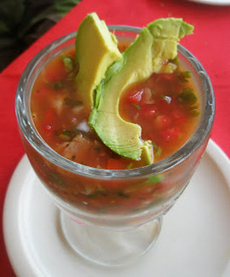 The distinguishing characteristic of Pacific ceviches is the use of tomato juice and, often, pickled chilies in the recipe. Eastern ceviches, from Mexico’s Gulf Coast, are less complex, using fresh chilies and foregoing the tomato juice. You can serve ceviche as an appetizer, as a light entrée (especially at lunch), or a snack. Chef Johnny’s mother eats a big bowl for breakfast when vacationing in Acapulco. Always buy the freshest fish you can find for ceviche. 1. PLACE the fish in a non-reactive mixing bowl and cover it with the lime juice. Let the fish marinate for 3 hours. (This part of the process is curing—essentially, cooking—the fish). 3. TASTE and adjust the seasonings to your preference. Garnish with avocado and serve with tortillas chips. *Mexican oregano is a different herb than Mediterranean/European oregano. It is in a different botanical family and has different flavor notes. Mediterranean oregano is sweeter, with anise notes. Mexican oregano is grassy, with citrus notes. That being said, you can substitute Mediterranean oregano; just use a little less of it. You can also substitute dried marjoram, which comes from the same botanical family as Mexican oregano and also has citrus notes. Dried lemon verbena is another option. The Mexican state of Veracruz on the Gulf Coast is known for its fine cuisine. While recipes can be quite elaborate, this one is quick and easy. This dish was adapted from a Spanish dish called Frita that uses chicken, not fish. The Veracruzeños substituted fish and also added the spicy chilies, as is typical when “Mexicanizing” a dish. 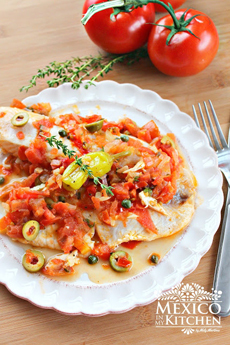 Tilapia Veracruz Style (photo courtesy MexicoInMyKitchen.com). 2. CHOP half a white onion, the garlic, bell pepper, pickled jalapeños and tomatoes. Sweat the onion, garlic, and peppers in a pot until soft; then add the tomatoes with as much of their liquid as possible. Add the olives, bring to a simmer and cook for ten minutes. 3. ADD the fish to a pot, covering the filets as best you can with the sauce. Cook, covered, for about 10 minutes, until the fish is done. Garnish and serve.